Modern digital cellular systems employ some form of channel coding to improve bit-error rate (BER) performance. Convolutional coding is the most widely used in these systems. However, operating at high signal-to-noise ratios (SNRs) requires larger antennas and bandwidths to be used, resulting in a large link budget. 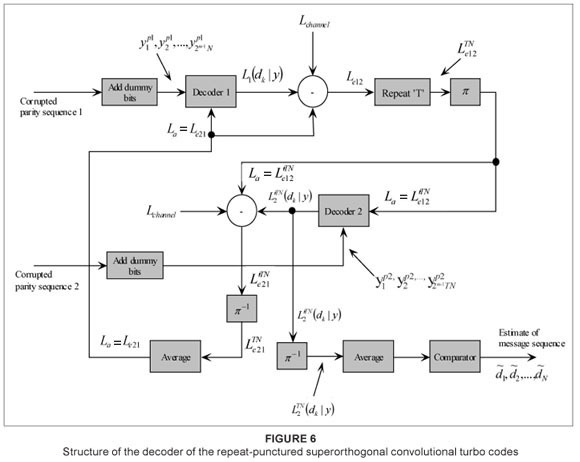 In the early 1990s, turbo codes (TCs) were introduced by Berrou et al.1, who showed their performance to be a few tenths of a decibel (dB) from Shannon's theoretical limit. Typically, for large frame lengths, for example N = 16 384, SNRs, Eb/N0, of -0.15 dB at a BER level of 10-3 have been reported.1,2,3 TCs have three enhancements in the coding area, namely the use of recursive systematic convolutional codes, random interleaving and the separation of intrinsic and extrinsic information in the decoder for cooperation. The performance of TCs improves with increasing interleaver size, due to the larger interleaver gain.3,4 However, increasing the interleaver size requires a simultaneous increase in the information frame length, because the interleaver size is set identically to the information frame length for the conventional TC, which makes it difficult to use TCs in applications that demand low-transmission delays, such as real-time voice communications. An error floor manifests in the BER performance of TCs because of the presence of low-weight codewords with small multiplicities. Several techniques have been proposed to lower the error floor,4,5,6,7,8,9 one of which is to use a repeat-punctured structure in the second parity branch of the conventional TC scheme.4 The repeat-punctured TC scheme proposed by Komulainen and Pehkonen not only increases the interleaver size, but also enlarges the low-weight codewords.4 Repeat-punctured turbo codes (RPTC) have shown a significant increase in performance at moderate to high SNRs.4 For example, for an information frame length N = 1024, simulation results have shown that the RPTC scheme has an approximate 2 dB coding gain over the conventional TCs, at a BER level of 10-5. Superorthogonal convolutional turbo codes (SCTC), introduced by Komulainen and Pehkonen4, is a low-rate coding scheme that is suitable for code spreading, for achieving coding gain and bandwidth expansion in direct-sequence code-division multiple access systems and for automatic repeat-request systems with partial retransmission.3,4,5 SCTC exhibits an improved performance over the classical turbo coding algorithm. For a small frame length (e.g. N = 200) and a constraint length K = 4, Eb / N0 values of approximately 0.7 dB at a BER level of 10-3 have been reported. 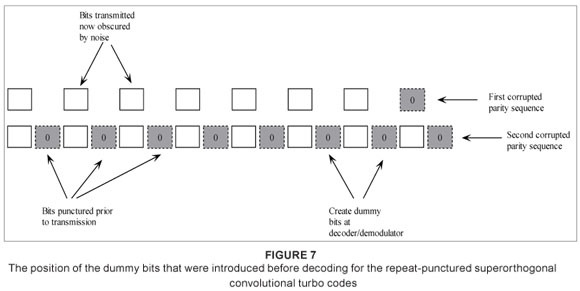 Motivated by the improved performance of RPTC, we investigated the performance of repeat-punctured superorthogonal convolutional turbo codes (RPSCTC). We can go one step further and include repetition and puncturing on both branches of the encoder. A scheme that utilises this configuration is referred to as dual-repeat-punctured superorthogonal convolutional turbo codes (DRPSCTC). Both of the above schemes use orthogonal signaling and parallel concatenation, together with repetition and puncturing, to improve the performance of SCTC for reliable and effective communications. Simulation results in the additive white Gaussian noise channel and the flat Rayleigh fading (FRF) channel are presented together with analytical bounds of bit error probabilities, derived from transfer function bounding techniques. 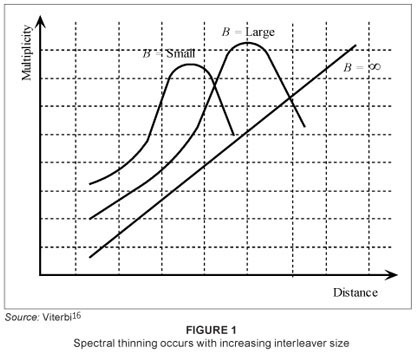 The distance spectrum is also presented for the new scheme and compared to the low-rate SCTC scheme. The paper is organised as follows: firstly, the concept of RPSCTC together with the encoding and decoding structures is introduced. We then present the DRPSCTC scheme and evaluate the performance on the AWGN channel and the FRF channel. Thereafter we present some analysis followed by the simulation results for memory depths, m = 2 and m = 4, together with their analytical BER bounds for AWGN and FRF channels and the codeword distance spectrum. Orthogonal, bi-orthogonal and superorthogonal convolutional codes are well documented.4,10 For an orthogonal convolutional encoder, all of the possible output sequences per branch of the trellis are mutually orthogonal. If we enlarge the orthogonal signal set to incorporate their complementary sequences, we have a bi-orthogonal signal set that has twice as many members for the same sequence length. By taking advantage of this extended set, we can have a bi-orthogonal convolutional code.3 That is, all of the encoder output sequences that leave the same state are antipodal. For superorthogonal codes, all of the encoder output sequences that either leave the same state or merge within the same state are antipodal and only one sequence and its complement are needed for every two states of the trellis. 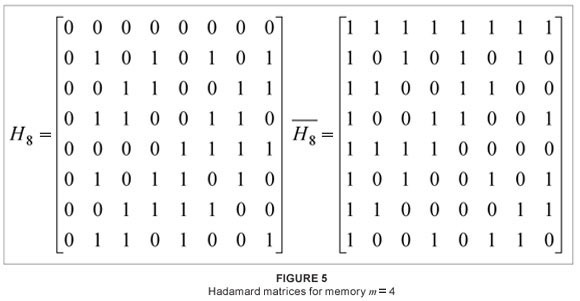 Many methods for generating the orthogonal signal set exist; one possible choice for generating the set of orthogonal sequences is the Walsh functions, which can be obtained from Hadamard matrices.3,4,10 A SCTC is simply a parallel concatenation of superorthogonal recursive convolutional codes (SRCC). RPTCs were introduced by Kim et al.12, who made use of a repeat-puncture mechanism to exploit the fact that larger interleavers increase the BER performance of the conventional TC.3,4,12,13 In the conventional TC, the information frame length is set identically to the interleaver size, such that if we want to increase the interleaver size then we need to pass larger frames of information into the encoder. However, larger information frames correspond to larger processing delays, both in the encoder and the decoder and would not be tolerable in many applications, such as real-time voice communications. RPTCs employ a repetition operation block prior to interleaving, which allows for small frame lengths and larger interleavers to be used in the same system. Simulations show an improved performance over the classical TCs for moderate to high SNRs.12 With a pseudorandom interleaver, the weight-2 input sequence is known to produce low-weight codewords for the conventional TC. However, with RPTC, a weight-2 input sequence becomes a weight-2T input sequence, where T represents a repetition index. 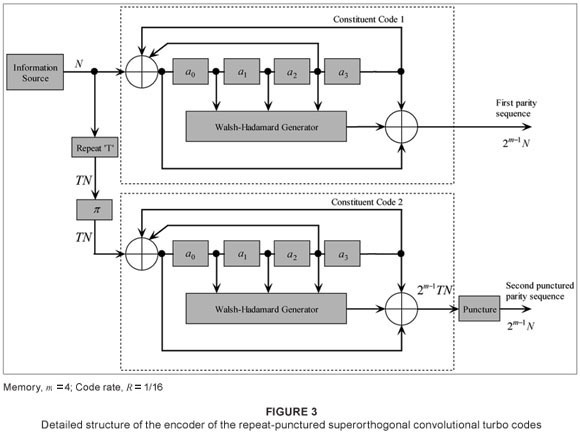 This significantly improves the performance of the TC, because the probability of the second constituent encoder producing a low-weight codeword is reduced, as a result of the recursive nature of the component encoders. When we puncture, the objective is for T to look like unity. In this paper, a repetition factor of T = 2 was used, however, T can be increased to lower the code rate even further, or to generate a series of rate-compatible codes. The distance spectrum shows that an RPTC with T = 3 has slightly more codewords at the low-weight end of the spectrum than when T = 2.12 This difference is as a result of the excessive puncturing required when T = 3. In addition, it is important to note that as T is increased, the computational complexity also increases. In the case of RPSCTC and SCTC, there is no common channel output stream as in the case of conventional TCs because the systematic information bit is not explicitly sent via the channel  but with appropriate mapping of the Walsh functions, the outputs can be made systematic. Komulainen and Pehkonen explain how the recursive nature of a code leads to the codewords being systematic in the case of SCTC.4,10 As a repetition factor, T = 2, was employed prior to producing the second parity sequence, we are at liberty to puncture every second bit out of every T bits from the Walsh sequence (punctured bits are replaced by a dummy bit '0' at the receiver, representing an erasure) in order to recover the loss in code rate (Figure 4). In Figure 4, punctured bits are represented by the positions of the shaded blocks. 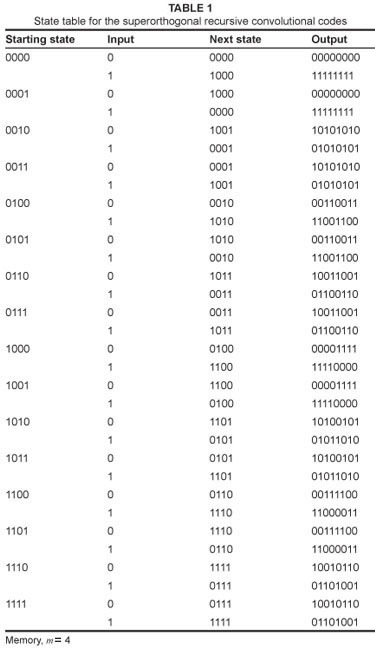 One of the bits in the first parity sequence was punctured to increase the code rate to R = 1/15. These positions also represent the positions where dummy bits would be inserted at the receiving end. Puncturing causes a drop in the performance of the code; however, further puncturing strategies could be investigated to minimise this drop in performance. need to be considered, as shown in Figure 5, where all the row and column sequences are Walsh sequences. Table 1 shows the state table for the SRCC with memory depth, m = 4, where the output sequences are Walsh sequences. Unlike the Viterbi algorithm, which finds the most likely sequence to have been transmitted, the maximum a posteriori (MAP) algorithm determines the most likely information bit to have been transmitted at each bit time k. Using a posteriori probabilities, for a small probability of bit error (Pb), the performance difference between MAP and soft-output Viterbi algorithm (SOVA) is very small. However, at low Eb / N0 and high Pb values, MAP outperforms the latter.13 The well-known MAP algorithm proceeds somewhat like the Viterbi algorithm, but in two directions, forward and backward, over a block of code bits.2,8,13,15 Similarly to the conventional TCs, RPSCTC uses the MAP algorithm in each of the component decoders. The decoding structure shown in Figure 6 makes use of an iterative technique, together with serial concatenation of the constituent decoders. An outer decoder, Decoder 1, and an inner decoder, Decoder 2, in cooperation produce soft decisions that are converted into extrinsic log-likelihood ratios (LLRs) that are mutually exchanged, thus increasing the reliability of the resulting decisions. In the first step of the decoding for RPSCTC, the punctured, corrupted first parity sequence from the channel is sent to Decoder 1. Because the sequence was punctured before transmission, dummy bits now need to be added and, similarly, for the second parity sequence. Figure 7 illustrates the manner in which the dummy bits are added at the input of the decoder. The lightly shaded, dash-outlined blocks represent positions at which bits were punctured to increase the code rate. Before either corrupted parity sequence is sent to a component decoder, dummy bits, '0', are introduced into these positions. is de-interleaved and averaged similarly to [Eqn 8] to yield N soft decisions. The soft decisions are then converted into hard decisions, that is, the estimate of the original message sequence. 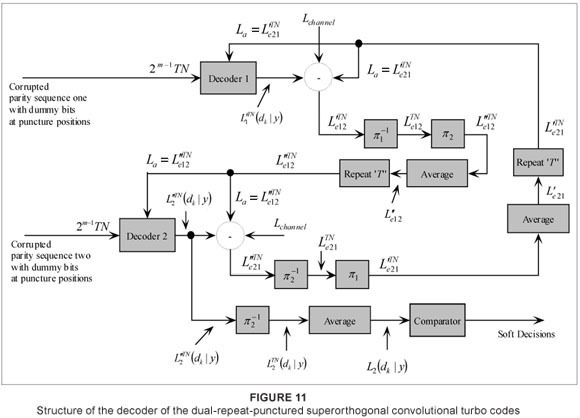 The dual-repeat-punctured superorthogonal convolutional turbo codes (DRPSCTC) scheme is an extension of the RPSCTC scheme. A simple modification to the structure, that is, dual repetition, can further improve the performance. The structure of the encoder for DRPSCTC is shown in Figure 8. The structure is almost identical to the encoder used for RPSCTC, with the major difference being that a repetition block is used prior to encoding both parity sequences. The message sequence of length N is first sent through a repeater structure which enlarges the sequence to TN entries. On their respective branches, the enlarged sequences are interleaved and then encoded with superorthogonal signals to yield sequences of length 2m-1TN. To control the code rate, the sequences need to be punctured using a special technique. R = 1/15. On the right side of Figure 9, two bits, represented by the hatched blocks, are monitored for a '+1' or a '−1', respectively. The first of these two bits is punctured if a '+1' is detected. However if a '+1' is not found, then the second of these two bits is checked for a '−1' and punctured correspondingly. In the event of both these bits holding the opposite value (a probability of 0.25), then both these bits are punctured, which is still on average effectively a code rate of R = 1/15. The decoder for DRPSCTC is similar to the structure of the decoder for RPSCTC. However, there is no explicit systematic output in the DRPSCTC decoder, thus eliminating the need for interleaving at the input. Firstly, the sequences need to be reconstructed before being sent to the constituent decoders. Figure 10 illustrates how the sequences are reconstructed. On reception of the parity sequences, the lengths of each of these sequences need to be checked to determine which sequence was punctured for an extra bit. If the first parity sequence is only shorter by one bit, then a '+1' is introduced into the sequence. Similarly, if the second parity sequence is found to be the shorter sequence, then a '−1' is introduced. Alternatively, if both sequences are short by a single bit, then a '−1' is introduced into the first sequence and a '+1' is introduced to the second. This technique eliminates any probability of error of this bit, represented by the hatched, dash-outlined blocks in the right portion of the diagram. At this point, each of the parity sequences should be of length 2m-1N. Next, dummy bits '0' are inserted into previously punctured bit positions, which are indicated by the lightly shaded, dash-outlined blocks in Figure 10.
is then de-interleaved by the second interleaver mapping to yield [Sqn 9], which is then permuted by π1. then averaged to yield N soft decisions, which are converted into hard decisions to yield an estimate of the original message sequence. There are two main tools for the performance evaluation of TCs: computer simulation and the standard union bounds. Computer simulation generates reliable probability of error estimates as low as 10-6 and is useful for rather low SNRs, because the error probabilities for larger SNRs are too small to simulate. The union bound provides an upper bound on the performance analysis of RPSCTCs and DRPSCTCs with maximum-likelihood decoding averaged over all possible interleavers. The union bounds for the RPSCTC and DRPSCTC schemes are all evaluated using the same transfer function method discussed by Divsalar et al.16 and by Xu and Takawira5. In this section, we need only present the expressions for the encoders for the RPSCTC and DRPSCTC schemes. for Encoder 2, where t() is the transfer function for the constituent encoder obtained by using the technique presented by Divsalar et al.16, d1 and d2 are the codeword weights for Encoder 1 and Encoder 2, respectively and the denominator in [Eqn 10] and [Eqn 11] represents the total number of codewords for information weight i and Ti, respectively. where q = 1 for Encoder 1 and q = 2 for Encoder 2. Eb / N0 is the SNR. In order to investigate the performance of RPSCTC and DRPSCTC, we simulated the schemes in the AWGN channel and the flat Rayleigh non-line-of-sight (NLOS) fading channel. An input frame of length N = 200 was used. A uniform interleaver was chosen and a straightforward puncturing pattern was employed, although other extravagant patterns could be investigated to yield better performances. For the decoder, 18 iterations were chosen, although this could be decreased at higher SNRs to shorten simulation time without compromising on accuracy. SNR has been previously defined for AWGN and Rayleigh fading channels13,19,20,21 The simulation results for the AWGN channel are illustrated in Figure 12 for memory m = 2 and code rate R = 1/3 (punctured from R = 1/4 to R = 1/3) and in Figure 13 for memory m = 4 and code rate R = 1/15 (punctured from R = 1/16 to R = 1/15). The performance curves are shown converging to the bounds. It can be seen that a coding gain of approximately 0.5 dB was achieved at a BER level of 10-3 and a coding gain of almost 1.5 dB was achieved at a BER level of 10-6 for a constraint length K = 3. Rayleigh fading is a statistical model for the effect of a propagation environment (or the heavy build-up of urban environments) on a radio signal and is a reasonable model for tropospheric and ionospheric signal propagation. 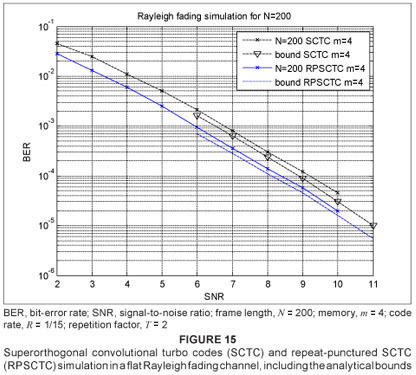 For NLOS between the transmitter and receiver, the scheme was also simulated in a Rayleigh fading channel, the results for which are presented in Figures 14 and 15. Again, the measure of quality of service chosen is a plot of BER versus SNR. 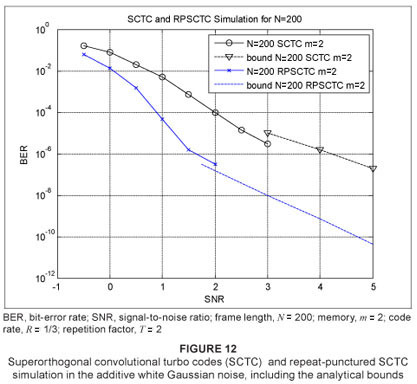 As a stopping criterion for the simulations for both SCTC and RPSCTC, 150 frame errors were used. The velocity used for the moving receiver was vc = 50 km/h and a fc = 2 GHz carrier frequency was used with Doppler frequency fd given by [Eqn 18]. The speed of light c is 3 x 108 m/s. Again, a frame length of N = 200 was considered at a code rate of R = 1/15. An SNR range of 2 dB 11 dB was considered so that the performance for low probability of errors could be investigated. 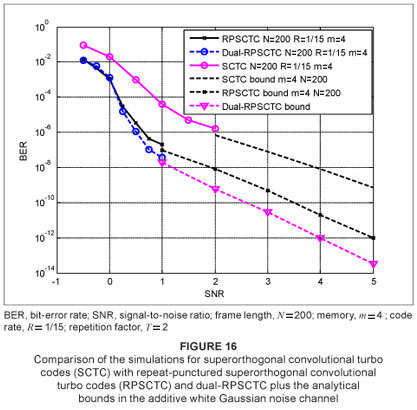 A coding gain of almost 1 dB was achieved throughout the SNR range of SCTC and RPSCTC. Simulation results for NLOS channels (modelled by the Rayleigh distribution) are exemplified in Figures 14 and 15. For frequency non-selective (FRF) channels with side information, a coding gain of approximately 0.5 dB was achieved at all BER values. Figure 16 shows the simulation in the AWGN channel for DRPSCTC for a frame length N = 200, memory m = 4 and code rate R = 1/15, supported by its bound. 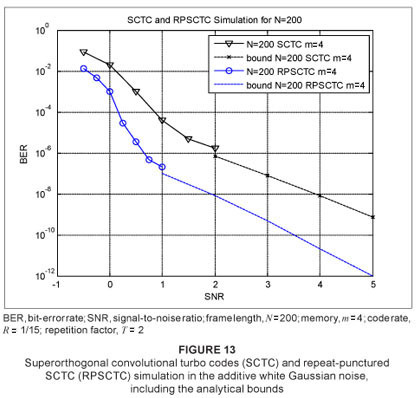 The BER versus SNR for DRPSCTC is plotted together with the simulations for RPSCTC and SCTC for memory m = 4 with their bounds. It can be seen that, as the SNR increases, the performance of DRPSCTC starts to improve, in comparison to RPSCTC. The turning point for this scenario can be seen at approximately 0.2 dB. 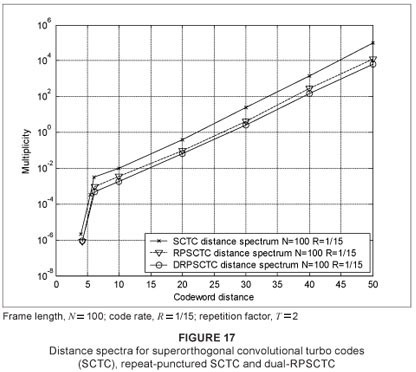 Figure 17 depicts the codeword distance spectra of the SCTC, RPSCTC and the DRPSCTC schemes with multiplicity on the ordinate axis and codeword distance on the abscissa axis. The distance spectrum verifies the performance improvement shown in the previous graphs (Figures 1216). It can be seen that the number of codewords with low weights (small distances, d) has been decreased and the spectrum has been shifted to the right as a result of the presence of a larger number of high-weight codewords. We have presented the results for two new schemes, RPSCTC and DRPSCTC, simulated in the AWGN and the FRF channels and presented together with their union bound, based on maximum-likelihood, derived from transfer function bounding techniques and the codeword distance spectrum. 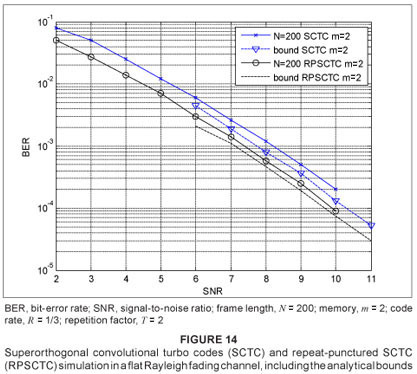 From the simulations and the analytical bounds presented, it is evident that RPSCTC and DRPSCTC offer a superior performance to that of SCTC in the AWGN channel, as well as in NLOS channels. The codeword distance spectrum that was presented motivates for this performance improvement. It is important to note that the improved performance that SCTC, and consequently RPSCTC and DRPSCTC, exhibit is achieved at the expense of bandwidth expansion and complexity and would be ideal for power-limited satellite communication links or interference-limited systems. One of the drawbacks of SCTC, RPSCTC and DRPSCTC would be the fact that the rate of the code is exponentially related to the memory depth of the constituent encoders used. Thus many more extravagant puncturing strategies could be investigated to yield better BER performances. In addition, the low-rate coding schemes presented above can be compared with low-rate turbo-Hadamard codes.